Axial Ball Bearings enhance household appliance efficiency. FAG rolling bearings can help reduce energy consumption in refrigeration compressors to improve overall appliance energy efficiency rating. Matched to eccentric shaft bearings in refrigeration compressors, products replace nominal plain bearings and come in 4 types. Both bearing washers can be supplied with or without raceways, and bearing cages are supplied in sheet steel or plastic. In basic design, axial bearing washers are punched, through-hardened, and polished. New rolling bearings for household appliances have been developed that reduce energy consumption in refrigeration compressors by up to five per cent. By using these energy efficient bearings, the overall energy efficiency rating of the compressor can be improved by one class. 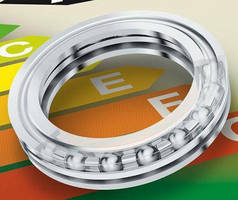 The new FAG axial ball bearings from The Schaeffler Group are specifically matched to eccentric shaft bearings in refrigeration compressors, replacing the plain bearings that are normally used in these mounting positions. Four types of FAG axial ball bearings are available, which can be freely combined. Both bearing washers can be supplied with or without raceways. Bearing cages are supplied in either sheet steel or plastic, matched to the operating environment. The bearing materials offer excellent compatibility with coolants and are resistant to varying temperatures. The sheet steel cage has a special 'filigree' (twisted wire) design, which not only provides high rigidity, but is even more suitable than plastic cages for the high temperatures that occur in these bearing positions. In addition, coolant compatibility tests are no longer necessary. The raceways in the axial washers provide even more secure guidance for the balls and improve load distribution and ball rotation. Overall, these characteristics result in a bearing that offers reduced wear and which has a longer operating life. Bearings with raceways on both sides are also available, which provide increased mounting security. In the basic design, the axial bearing washers are punched, through-hardened and polished, and both sides can be used as raceways. The size of the bearing can be adapted to suit individual mounting locations. With a total of 65,000 employees at over 180 locations around the globe and group sales of 7.3 billion euros (fiscal year 2009), the Schaeffler Group is one of the world's leading rolling bearing manufacturers and automotive component suppliers. The corporate group includes the INA Group with headquarters in Herzogenaurach, the FAG Group based in Schweinfurt as well as the LuK Group, with headquarters in Bühl. Rail/Bearing System is anti-magnetic and corrosion resistant. Anti-Reverse Bearings operate directly on shaft. Concentric Locking Ball Bearing suits high-speed applications. Ball Bearings come in 2 shaft attachment methods. Plastic Clip Bearings suit sheet metal applications.